At Weather Tight, we think of our team as family. Our extended clan of 100+ includes the friendliest, most helpful people in the industry, and we’ve created a fun, exciting place where we actually enjoy what we do. If you’ve been looking for a new job with a great atmosphere and opportunity, we believe you’ll find it here at Weather Tight. Weather Tight Is Becoming Employee Owned! One of the many perks of working for Weather Tight is becoming an owner. 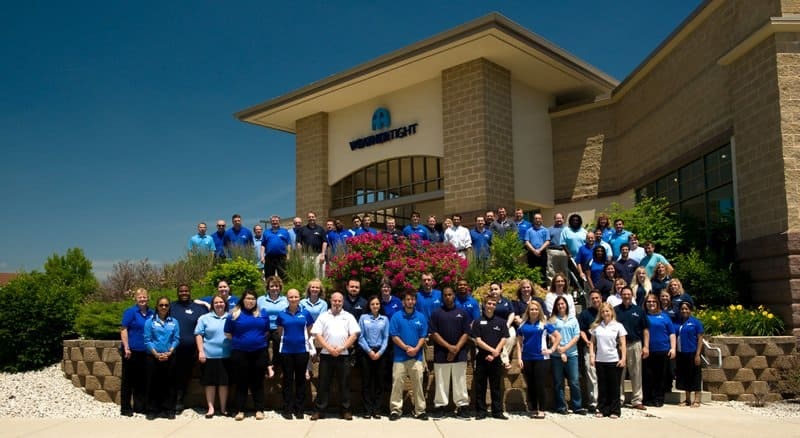 Weather Tight has formed a new ESOP (Employee Stock Ownership Plan). Eligible employees will enjoy the benefits – a great retirement plan! The employees make no investments other than their hard work and best efforts. Taking care of customers is our first priority, but we also encourage our team members to have fun, be themselves, and enjoy their time here. We are incredibly proud of the work culture we’ve built, because we know how important it is to love what you do and where you work. We treat our employees the way we want them to treat our customers—with respect and honesty. We also value team members who are supportive, reliable, enthusiastic, and determined, and know it makes a difference to homeowners, too. Whether you’re a part of our installation crew, customer service group, or marketing department, you’ll be part of a team you can count on, and one that will count on you, too. We support an exceptional work/life balance and encourage every Weather Tight employee to attend our many group outings, company picnics, potluck lunches, holiday events, giveaways, and more. Spending time together outside of work helps us bond as a team, and emphasizes the importance of friends and family. Because Weather Tight values experience, retaining great employees is incredibly important. Everyone receives an annual review and our owners, Tod and Todd, maintain an open door policy. More importantly, they know everyone’s name, and encourage team members to come to them directly with any questions or concerns. Since our start more than 30 years ago, we’ve been mindful to always treat our employees with the utmost respect. After all, our team is a major reason for our continued growth as a leader in exterior remodeling and home improvement services. They are the ones working together every day to install windows, doors, siding, roofing, and gutters and gutter protection for residential buildings, including condos, apartments, and rental properties throughout 10 counties in Southeastern Wisconsin.